Editors Note: 13 days later EXAS was at 21.40, we were up 26% at this point. We entered from 16.59-17.25 on the first day for a 16.85-16.90 average entry. Exact Sciences- Colon Cancer DNA test provider, just approved this week. Also working on Pancreatic Cancer tests with Mayo Clinic. High yesterday morning on FDA approval was $19.15 in pre-market on a spike up. We saw that gap though at 17.09 and figured it would close, so sure enough the stock pulled back all day towards the gap almost filling it. The company presents this morning on a conference. The FDA approved use of their DNA based test for colon cancer after years of work with the Mayo Clinic to get to this point. Skeptics think that the reimbursement rates will be alot less than $500 the company is projecting, but we think that is priced into the stock and its priced for potential upside surprise. A 1.5 billion market cap. Each test will retail at $599 and is done at home and then mailed in. The test can detect 92% of cancer related conditions for Colon Cancer and then a Colonscopy can be ordered. It also can prevent needless Colonoscopy exams which are not fun. You must fast, you have to clean out your system if you will, you are under anesthesia and its invasive. The new EXAS test is non invasive…. So what we have is a tug of war between bulls and bears… with a 1.5 billion market cap, if they sell 1 million tests 3 years from now at $599 a clip, thats 600 million in revenues…. 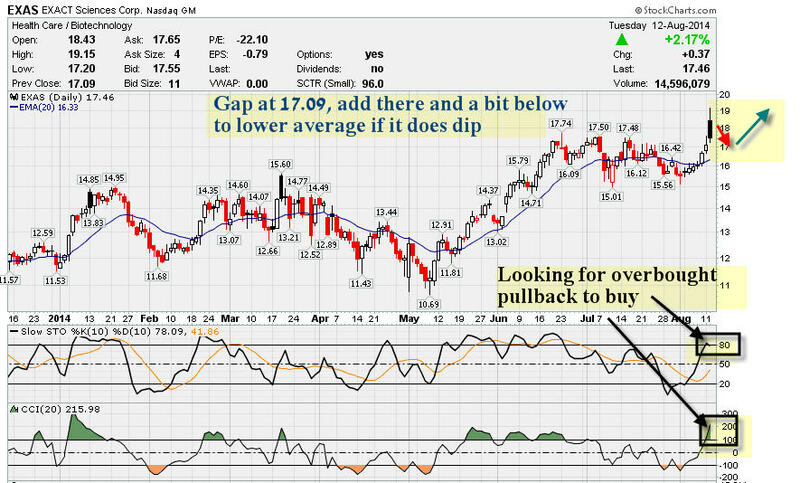 Enter at Max entry of $17.75 and below and a gap fill at 17.09 is possible, use that to add to positions. No stop yet… this may be a bit volatile near term. Pyramid into the stock with several buys adding on dips… never all in one buy.